Again great news for weblin. 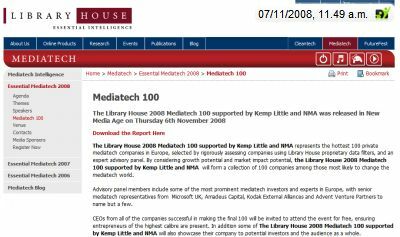 The Library House 2008 Mediatech 100 represents the hottest 100 private mediatech companies in Europe - and weblin is one of these! We are very proud and happy to be part of this group of famous and successful companies. Weblin is listed in the category of Community and Sharing, where we are in very good neighbourhood with another Hamburg based company "verwandt.de". Congratulations to Sven and Daniel, maybe we meet on Tuesday in London to attend the awards event.